Tequila is trending and now, guests at Macayo’s Mexican Kitchen in Mesa can attend the Macayo’s Tequila Experiences Cocktail Dinners through the end of August. A friendly face is there to greet you and direct you to the start of cocktail hour where you’ll enjoy their homemade chips and salsa and a House Margarita. When the cocktail dinner is ready to begin, the guests are brought upstairs for a night filled with food, tequila and live music by Nick Hranek of B&B Music. A Chef-inspired menu has been thoughtfully created for an incredibly delicious evening. 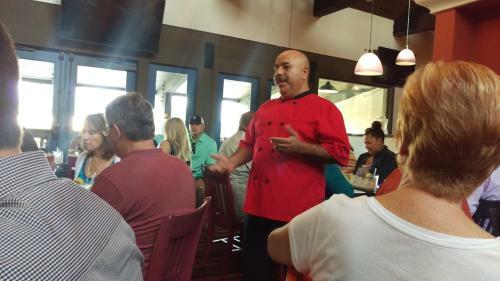 As each course is delivered to your table, the Chef will come out to introduce the course, its inspiration, what cues in the tequila they felt were most complimentary to the food. The tequila purveyor is also in attendance to better speak to the tequila development and increase your tequila knowledge. You’ll be a hit at the next happy hour with your friends!